Wildly popular in the 60’s and 70’s, fondue has made a comeback in recent years. Although there are many varieties, Beef Fondue, otherwise known as Fondue Bourguignonne, is probably the easiest to prepare. An added bonus is that each person determines the doneness of their own meat. Rare or well-done, everyone is accommodated! CAUTION: You will need a metal fondue set for this recipe. A set should include a metal fondue pot, a stand, a burner unit and fondue forks. Read the instructions carefully before using. Although electric fondue pots are available, they don’t offer the same flare that Sterno or denatured alcohol burners do. The following recipe is not to be used with an electric fondue pots. If you wish to use an electric fondue pot, follow the instructions in the manual. DO NOT use a clay or ceramic cheese fondue pot for beef fondue! The hot oil will break the pot. Don’t forget to extinguish the flame in the burner unit when the fondue fun has come to an end! Fondue sets normally come with a small metal “spoon” specifically designed for covering the burner unit, thereby putting out the fire. Remove the meat from the refrigerator 30 minutes before serving. 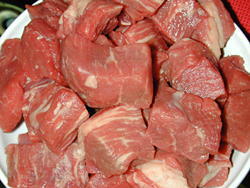 Place meat in a bowl and cover until ready to be served. Set up the the stand and fill the burner as indicated in your fondue set manual. Fill a metal fondue pot halfway with vegetable oil. Heat on the kitchen stove over medium-high heat until it reaches 375 degrees, or until a bread cube dropped into oil cooks to a golden brown in 30 seconds. Carefully transfer pot to stand. Light the burner with a long match in the center hole. Adjust the burner unit so that the flue (the little holes on top of the burner) are completely open. This will allow for the hottest possible flame. 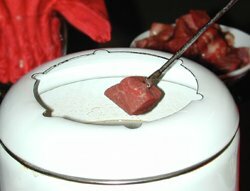 Allow each person to skewer a piece of meat with their fondue fork and place it in the fondue pot for deep-frying. Each person can cook his meat to his desired degree of doneness. If the oil temperature drops below 360 degrees, return to stove top and reheat, adding more oil if necessary. 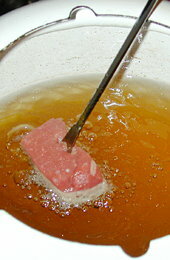 Low oil temperature will cause the meat to absorb the oil. You can determine the temperature by affixing a meat thermometer to the fondue dish, but you’ll know the oil is hot enough when it bubbles around the food immediately after it is added to the pot. This entry was posted on Wednesday, August 29th, 2007 at 5:14 pm	and is filed under Appetizers, Carnivore, Main Dishes, Master Recipe Index, Party Food & Snacks, Speed Queen (30 min/less). You can follow any responses to this entry through the RSS 2.0 feed. You can leave a response, or trackback from your own site.